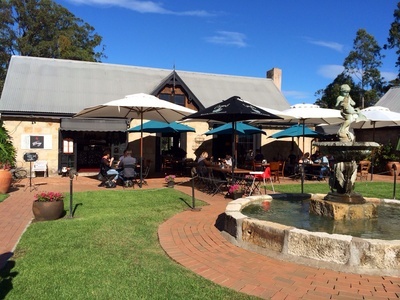 Cafe Enzo in the Hunter Valley is one of those places you fall in love with at first sight. Set in a rustic wooden and sandstone building with abundant classic old world charms, this unique cafe is able to instantly make you leave your woos behind and relax you. There is no pretense of conformity to the usual cafe style or unnecessary pom and pageantry...you get what you see. The rustic homely feeling that instantly engulfs you once you are inside the cafe is complimented and completed by the lack of uniformity that surrounds you. None of the tables matched each in their style, and neither did the chairs. Even the table decor was unique to each table. Only the cruet set, with one wooden pepper grinder and one white ceramic salt shaker, was the one bit of matching decor that I noticed inside Enzo.The wooden and sandstone walls were adorned with empty photo frames - something I have not seen before. This almost complete lack of uniformity that one usually does not see in other cafes was quite refreshing. The selection of magazines, papers, cosy nooks to bunk down and read all send but a subtle message inviting you to put your hair down, relax and completely enjoy your visit. That is indeed what we did one whole morning when me and my family dropped into cafe Enzo for breakfast. 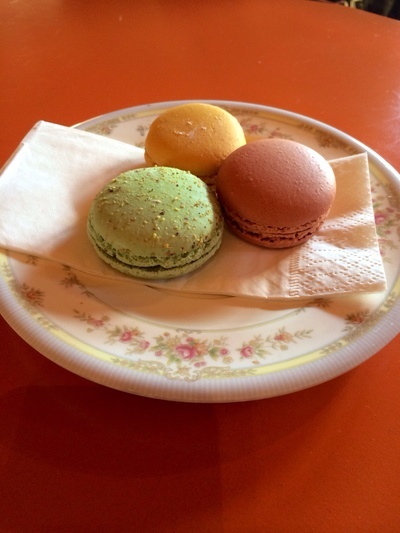 The staff at cafe Enzo are extremely attentive giving an ear to even their youngest customers' needs. They do not fail to inquire, not once but several times if you need anything more during your meal. The meals actually do not require anything more, as they are excellent on their own when they are brought directly from the kitchen. 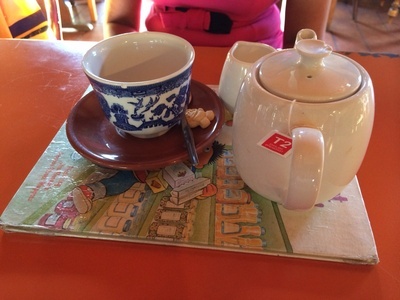 To start off, I ordered my usual English breakfast tea with milk and no sugar. The pot and the cups arrived at the table almost immediately quite uniquely presented on a children's book as a tray. The menu gave quite a selection of breakfast choices, lunch and other sweet options. On inquiry, the staff assured us that the meal portions were quite enough for a single individual. 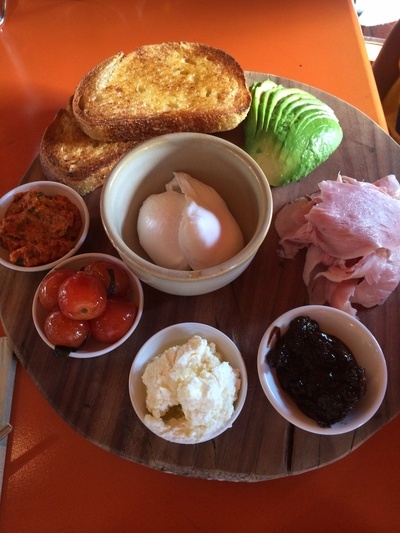 Enough is not the word that is suited to describe the Ham breakfast board ($24.00) I ordered. It was more than enough with two poached eggs, two pieces of sourdough bread, ham and avocado with other little bowls of accompaniments. I added onion jam as an accompaniment to this meal. I was glad I decided to share my meal with my son. The board was full of flavour, colour, and was beautifully presented on a wooden chopping board. A special mention should go to the pistachio red pesto which comes with the meal. This little bowl of taste is enough to add a different dimension of flavour to my poached eggs. The onion jam, of which is cooked daily in the Enzo kitchens is a must to taste. It's one of those accompaniments that goes with just about everything and anything. 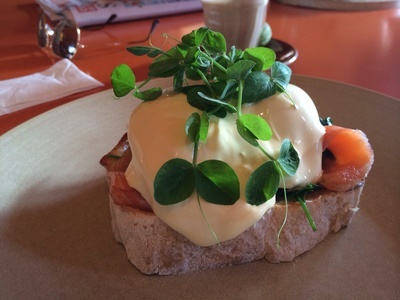 Enzo 'benedict' with poached eggs, baby spinach and hollandaise sauce served on toasted ciabatta topped off with fresh green herbs ($18, or with an additional choice of ham $23, chorizo $24 or smoked salmon $25) is another brekkie option that I would strongly recommend. This was a filling plate of delicious flavours combined together to create an interesting twist on the classical eggs benedict. 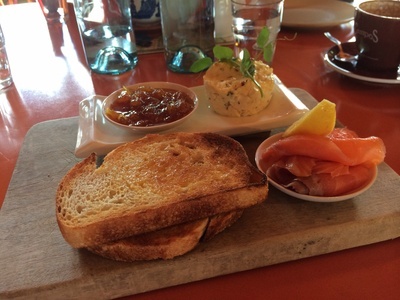 The baked ricotta served with smoked salmon and cumquat marmalade served on sourdough ($19) was a unique breakfast choice. The marmalade was the best that we had ever tasted. Upon inquiry we were informed that this was in fact made on site regularly from local produce. We regretted the fact that we could purchase a bottle to enjoy on a another day. The perfect option for those who don't fancy a large meal to start off the day is the seasonal fruit bowl ( $17.50 - add banana bread to total $23.50). 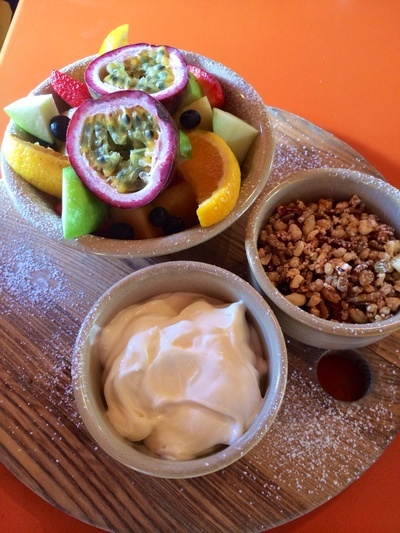 Freshly cut fruits come well presented on a board, together with the most delicious home made vanilla yoghurt and a different kind of muesli; which I am sure is specially made to serve at Cafe Enzo. Bookings are highly recommended, especially if you are planning to visit Enzo on a weekend morning. The alfresco dinning area is never empty, especially on a sunny morning; but if you are lucky you might be able to get a table inside. 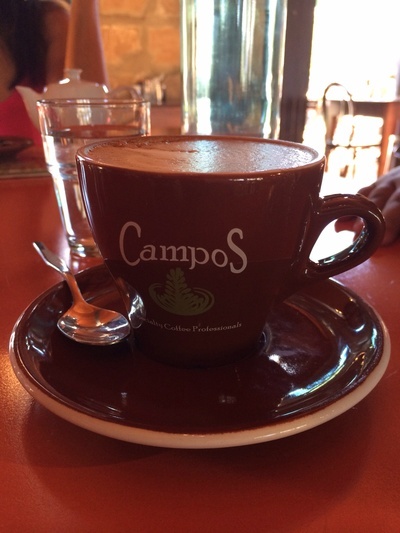 Why: Great little cafe to relax and have good food. When: Breakfast, Lunch and Tea. What is you dream holiday? What are some interesting chalkboard signs you have seen?